Alright, everyone, I am getting this second post up as I had promised earlier this morning/last night. I have started contributing to this website Brooklyn Exposed, and this article about Cobble Hill was one of the first column ideas I had pitched to them. The actual article as it will appear will be slightly different from the way it will appear here, but I am going to put it up for your weekend enjoyment - you know, just something to think about. 1. This weekend I will be sitting down with Erik Lilleby and Janelle Sing who has also started her own blog, Giovanni and Giotto and we will be discussing the popular television show Gilmore Girls. Both Janelle and Erik are old friends of mine and they are probably two of the foremost minds on the show Gilmore Girls in the United States of America. This round-table podcast has been in the works for a few weeks now, so I am looking forward to it and preparing diligently with my Gilmore Girl research to pose the tough questions to these pundits. 2. Monday will most likely see the next basketball column as there are some interesting storylines that are developing in each Conference Semifinal Series and I need to take the weekend to see how some of those storylines play out. Tonight, should be a must see night of basketball as the Celtics and the Cavaliers square off on ESPN at 7:00 PM with their series tied at 1-1 and the series shifting back to Boston for two games. There has been plenty of speculation about Lebron's injured elbow as well as the Celtics finally rediscovering that their team dynamic revolves around Rajon Rondo and the fact that he is now the best player on their team, rather than Pierce, Allen or Garnett. The second game of the night will be the Phoenix Suns taking on the San Antonio Spurs. The Suns are up 2-0 in the series, but now the series is going back to San Antonion for two games. The Spurs have traditionally owned the Suns, but this year's Phoenix team seems different and will definitely be a tough out. I think we are looking at a Lakers vs. Suns Western Conference Finals series, which I sort of hope the Suns win. 3. The podcast download battle between Nick Mencia and Erik Lilleby is now tied at 24 downloads a piece as we head into the weekend. Who will get bored this weekend and push one podcast over the top? I have had two page visits that emnated from internet connections in Pakistan, will there be a third? And will that third one choose to download the voice of Nick Mencia? Or will it be Erik Lilleby? These are the suspenseful things you come to this blog for. Who needs Lost when you have Puddles of Myself? Let’s say you’re 24 years old and it’s a beautiful day in late April; the sky is absolutely clear and you have recently resigned from an office job you detested in order to pursue your creative passions. Let’s say this life decision has led you to save all the extra money you have in order to pay the rent in Williamsburg. With all of this established, how, you might ask, can one enjoy a relatively cheap day out in Cobble Hill? This is precisely what my friend and I were able to accomplish a few Saturdays ago. “Let’s get lost somewhere tomorrow,” my friend texted me on a Friday night. The idea sounded fine to me and I had been meaning to wander around Cobble Hill ever since the winter weather had broken at the end of March. So, my friend came over with a basket containing bread, cheese, soppressata and mint leaves. The mint leaves were to be used to make mint juleps in preparation for a Kentucky Derby Day party she was putting on the following week. I bought the bourbon and we mixed a batch of slightly sweet mint juleps in an old lemonade bottle. With all our supplies set, we hopped on a right on time G train heading south. We got off at Bergen Street and walked east towards the water and Court Street. After hitting the pleasant bustle of Court Street, my friend turned to me and said, “We should find a park.” I’d been to Cobble Hill before, but I couldn’t remember a park. However, walking down Congress Street and passing each of the regal and inviting brownstones, we came to the tiny Cobble Hill Park. 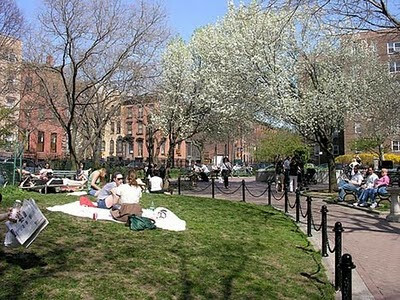 The park is located at the square of Congress Street, Clinton Street, Verandah Place, and Henry Street. There is only a small plot of grass, but it is in a quiet square that is surrounded on one side by brownstones and on the other by colonial looking apartment buildings that might belong in Providence. So, we sat and ripped pieces of bread with our cut soppressata and cheese and ate them as a lunch in the sun, with sips of slow warming mint julep. We sat, talked and tanned in the park before getting antsy at the thought of discovering more of the neighborhood. 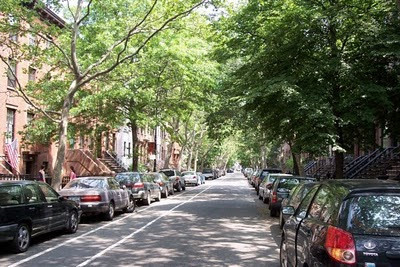 At the southwest end of the park, we went south on the sun-dappled Clinton Street, passing stoops that led to large well-kept wooden doors, the likes of which we do not often see in Williamsburg. We continued down Clinton, turning west on Union and then south onto Court Street. We stopped into G. Esposito and Sons Pork Store just to marvel at their selection of cured meats and other Italian delicacies that far surpassed our modest picnic. My friend spotted a flea market on the side of P.S. 58, which is directly across from the playground at Carroll Park, where we milled around people selling Egyptian clothing and tiny, self printed baby jumpers, one of which our friend bought for a mutual friend of ours who is expecting. The allure of Smith Street caught my companion and we doubled back north. Friends of ours were going to join us for dinner so we wanted to scout ahead. The best prospect we both agreed on was Grocery (288 Smith Street) with its take on the French bistro menu and its affordable prix fixe early dinner menu. Smith Street is also packed with boutique clothiers and I found myself popping in and out of each one as my friend (a budding designer herself) wanted to view the goods. We were both especially impressed by the clothes at Smith & Butler, which left us muttering, “Some day, some day” as we walked out to take tiny sips of mint julep. We decided to do one more swoop through the neighborhood before picking a place to eat dinner, so we headed back up to Court Street by way of Warren and again admired the impressive homes. We thought about a friend of ours who had just bought a house and wondered what it would be like to raise kids in one of these impressive and well maintained buildings with their stretching stoops and staircases. At the corner of Degraw and Court, we spotted free samples of food outside of Sal’s Pizzeria. They were giving out pulled pork and jerk chicken on grilled pieces of flat bread. At that point, I peeked in and caught a glance of what looked to be some tremendous looking authentic brick oven pizza. My mouth was watering so I suggested we turn down Degraw back towards Clinton to escape all of the food. The friends we were meeting for dinner called us as we walked along Clinton and suggested that we go to Prime Meats. I had heard that Prime Meats was a fantastic restaurant, although a bit pricey. However, I decided that you are only young once and that I could scrounge up the rent money somehow. I told my friend to come and pick us up so that we could all have a terrific dinner. As my friend and I sat on the bottom step of one of the brownstone stoops, taking in some of the last light of the evening, I looked at one of the windows of a home across the way. Again, I wondered what it would be like to live in one of these buildings. With no job, a rent to pay and nothing but the freedom to decide how I would next make my income, I figured that I had plenty of time to find the best way to make it through one of these well lacquered wood doors and, that someday soon, I could peek my head past the lace curtains draped across one of these windows. “Great day,” my friend said.